By far the weakest of the Arab “front line” states bordering on Israel (not counting Lebanon, which was generally not counted at the time, either), the Hashemite Kingdom of Jordan had a proud military tradition. The Arab Legion, founded in 1920 from former Ottoman personnel, became a well-trained unit under the leadership of a British officer, Sir John Glubb. The Legion fought well during the Second World War, seeing action in Lebanon, Syria and Iraq; it also prepared for deployment to Italy but was not sent. The greatly-expanded Legion also fought in the 1948 war with Israel, with its British officers continuing in their roles despite orders from London to refrain from participation. It did not live up to its fearsome reputation, making it easier for the new King Hussein to merge it with Jordan’s National Guard in 1956 to form the Royal Jordanian Army. He dismissed the British officers, including Sir John. 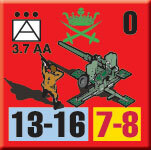 By 1967, the Army totaled nine infantry brigades, two armored brigades and a number of smaller independent units. 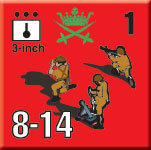 The Jordanians appear in 13 scenarios of our Panzer Grenadier (Modern): 1967 Sword of Israel. We looked at Jordan’s armor in an earlier installment; let’s look at the rest of their forces. Jordan’s Army had been equipped by the British until the late 1950’s, when American arms began to arrive. A major shipment of additional American weaponry arrived just before the 1967 war, funded by the Saudis and other Arab states. Jordanian infantry carried the American M1 Garand semi-automatic rifle, the same weapon as most Israeli infantrymen; a few second-line units still had the British-made Lee-Enfield .303 caliber Mark IV. They had the American-made M20 Super Bazooka as their squad anti-tank weapon, and the Bren light machine gun as their squad automatic weapon. Despite having ejected their British officers, the Jordanians retained British organization in 1967, which had changed a great deal since the Second World War to come closer in line with those of other nations. A Jordanian infantry battalion had three rifle companies, each with three rifle platoons and a heavy machine gun section. It also had a heavy weapons company, with platoons of heavy machine guns, medium mortars and heavy mortars. Jordanian heavy machine gunners had a variety of weapons (though not, apparently, within the same battalions). Most heavy machine gun platoons had the venerable Browning M1919 .30-caliber machine gun; a few used the .50 caliber Browning. Others had the reliable Vickers .303, introduced in 1912 and still in production at the time of the Six-Day War. Jordan received the then-new M113 armored personnel carrier before the Israelis, or any other Middle Eastern army. By 1967 they had already seen extensive action in Vietnam, wielded by the Americans, South Vietnamese and Australians. 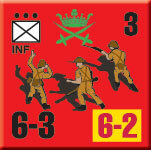 The Jordanians deployed their one-one-threes in their mechanized infantry battalions in the two armored brigades, which might have given them an edge in mobility had the Egyptian high command not scrambled pre-war plans in the first hours of the conflict. Though less capable than the 81mm and 82mm mortars fielded by other participants, the Jordanians retained their Royal Ordnance 3-inch mortar, a 76mm tube familiar to Jordanian mortarmen since the Arab Legion’s campaigns in World War Two. It lacked the range and explosive load of Israeli 81mm mortars, putting the Jordanians at a distinct disadvantage. The heavy mortar had become a favored weapon of the Soviets in the Great Patriotic War, and of the Americans in the Korean War. That preference had filtered to most nations’ armies by the 1960’s, and the Jordanians had an excellent weapon in the British-made Royal Ordnance 4.5-inch mortar, a weapon introduced in the last year of the Second World War. 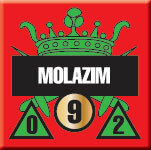 The weapon had good range and explosive power, and an outstanding rate of fire. The Jordanians expected to be outmatched in the air and to that end had tried to equip their ground forces with sufficient anti-aircraft protection; in the actual war, ground-based lasers wouldn’t have stopped the IAF. 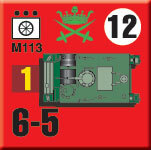 Heavy anti-aircraft fire came from the well-tried British-made Vickers QF (quick-firing) 3.7-inch gun. It was effective in its anti-aircraft role, but rarely used against enemy tanks despite good performance; it was a very heavy piece compared to similar weapons like the German 88mm gun or American and Italian 90mm weapons. 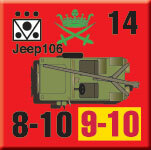 That made it difficult to deploy against enemy armor, and the Jordanians don’t appear to have attempted to do so. For close protection, the Jordanians relied on the same 40mm Bofors gun as nearly every other army on the planet. It remains an effective weapon 50 years after the Six-Day War and 85 years after its introduction, still in use in many armed forces around the world. Jordanian anti-tank companies fielded the very modern American-made M40 106mm recoilless rifle, a weapon introduced to American forces after the Korean War to replace its failed predecessor, and eventually replaced by the TOW anti-tank missile in American service. It gave the Jordanians good, mobile anti-tank capability with a weapon that did not require as much specialized training as the early anti-tank missiles fielded by other combatants in the Six-Day War. 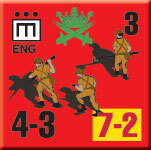 Jordanian artillery performed reasonably well during the Six-Day Way, at least in the early fighting when they remained in their pre-war positions and fired at long-established targets. When Egyptian Field Marshal Amer ordered a pointless mass demonstration by all Jordanian artillery and machine-gun units along the front, the fire inflicted little damage on the Israelis but did allow them to pinpoint the location of almost all Jordanian artillery batteries – most of which had been unknown to them. 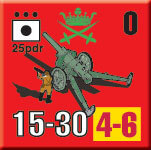 Subjected to counter-battery fire and the attention of the IAF, many were put out of action and others forced to flee. 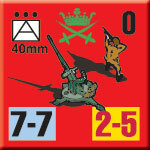 Jordanian field regiments (the Jordanians used British terminology) had the ubiquitous 25-pounder, a lightweight piece compared to those of the Israelis and the other Arab armies, but still very effective – many British field regiments retained the 25-pounder in 1967, though it was giving way to new 105mm pieces. It had the blessings of crew familiarity, rapid deployment, and massive stocks of ammunition. The Jordanians had just purchased new, heavier pieces for their independent artillery battalions: American-made M59 155mm “Long Tom” field guns, which could theoretically reach any useful target within Israel, and M115 203mm howitzers with even greater range. These batteries gave good service, but attracted a great deal of attention from the IAF. Despite Israeli fears, in actual service the Jordanians did not engage in terror bombardments, using their long-range artillery to support battlefield operations. Jordan went to war in 1967 with a small but well-trained army, equipped for the most part with modern weapons – in many cases superior to those of the Israelis. And they proceeded to suffer a terrible defeat, pulling out of the West Bank even before six days had elapsed. The problem lay with the Jordanian officer corps. While Jordan produced a number of good and dedicated officers, educated Jordanians almost exclusively came from the towns and cities. 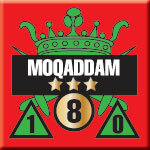 The Bedouin who formed the backbone of the rank and file despised these effete city Arabs, who returned the dislike with gusto and had no wish to join the king’s army – they had many more and better opportunities in business, academia and civilian government. The Arab Legion had avoided this problem by filling officer slots with British expatriates, but King Hussein had been unable to replace them with Jordanians following their ouster in 1956. Things were not quite as bad as in the Syrian Arab Army, where Defense Minister Hafez el-Assad intentionally sought out and promoted the stupid and lazy, those least capable of fomenting and carrying out a military coup against the government. But King Hussein had his own fears, concentrating Palestinian personnel in front-line brigades and keeping loyal Bedouin units on the East Bank, and always positioned between the Palestinians and the capital, Amman. 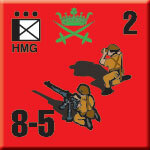 Israeli units more than once reported fierce resistance by Jordanian units in fortified positions, with the defenders holding out to the last man. 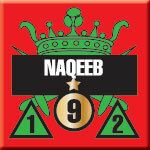 Yet none of the corpses or wounded ranked higher than sergeant (raqeeb) – the officers readily abandoned their men. Lacking effective leadership, the Jordanian brigades could not stand up to the Israelis, with their surplus of well-trained, highly-motivated junior officers. 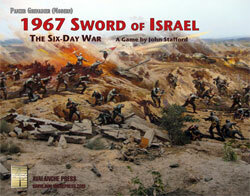 Click here to order Panzer Grenadier (Modern): 1967 Sword of Israel right now.